My husband loves traditional comfort food. Give him a plate of American Chop Suey, macaroni and cheese or meatloaf and mashed potatoes and he's a happy camper. Sloppy Joes are one of his favorites, but many recipes for it are fairly bland and uninspired. So when I make Sloppy Joe sandwiches I always do something special to amp up the flavors. Sometimes I'll add extra tomato paste and some Italian seasonings for what I call Sloppy Giuseppe sandwiches. Other times I'll add oregano, a touch of cinnamon and some crumbled feta cheese and top the ground beef mixture with a simple Tzatziki sauce made from yogurt cucumber and garlic sauce for what I call Greek Joes. 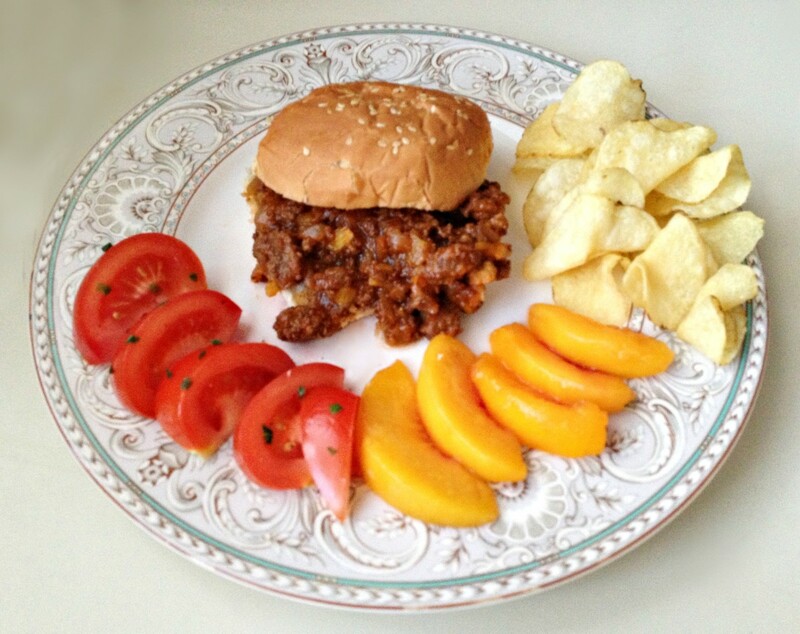 I'm a big fan of barbecue and my favorite BBQ sauce is thick, sweet and smoky, so I decided to create Southern style sweet and smoky Sloppy Joes that combine my favorite barbecue sauce flavors with sweet Georgia peaches. I'm pleased to say that my recipe is not only delicious but also husband-approved! I wanted these Sloppy Joe sandwiches to taste like my favorite style of barbecue sauce, only better. I decided to add sweet peaches, peach nectar and sugar-free peach preserves. Because I live in Boston and not in Georgia and wanted to be able to make this recipe any time of year, I went with flash frozen peaches and bottled peach nectar. I used ketchup (AKA catsup), molasses and diced fire-roasted tomatoes to create the rich, sweet and smoky taste of my barbecue-style sauce. Then I added smoked paprika and liquid smoke flavoring for that smoky barbecue flavor. 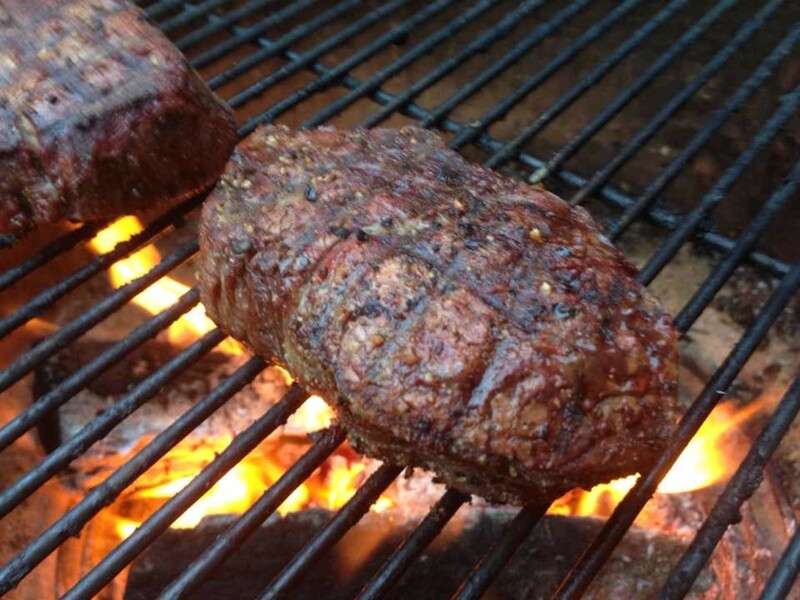 Finally, I kicked up the flavor profile a notch with a little apple cider vinegar, Dijon mustard and chili powder. 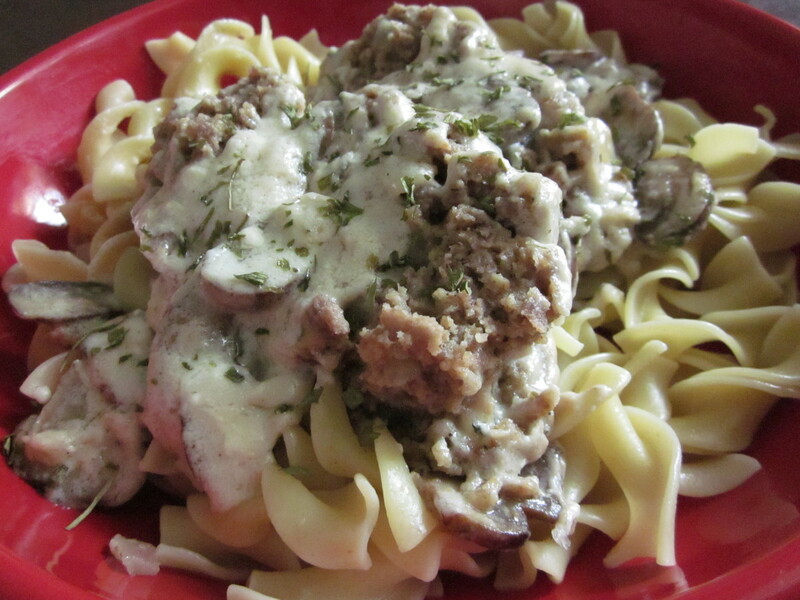 Originally when I developed this recipe I used lean ground beef plus some olive oil to replace some of the saturated fat with a flavorful, heart healthy oil that also allowed the onions and garlic to cook nicely. But since my husband and I are trying to cut down on our consumption of red meat, after making the first batch with two pounds of lean ground beef, I decided to make another batch using one it with one pound each of 85% lean ground beef and 93% lean ground turkey, plus an extra tablespoon of healthy olive oil to replace some of the missing fat from the extremely lean turkey. 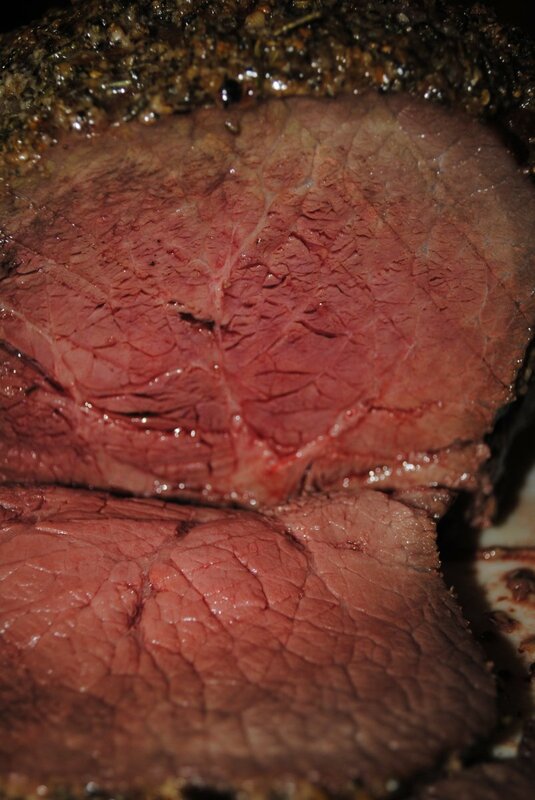 It was just as delicious as the all-beef version. In fact, my husband didn't even notice the substitution! I also made the half beef, half turkey version for my meat-loving brother when we flew cross-country to visit him recently. He loved these so much that he immediately asked for the recipe, even though he didn't cook much at the time! Best of all, made this way, each generous serving of Sloppy Joes is only 482 calories and contains only 16 grams of fat! Of course, it wouldn't be a Sloppy Joe sandwich without a nice soft sandwich roll or hamburger bun to sop up the sauce. I prefer sesame seed-topped potato rolls but you can use any type of burger bun you prefer. Sometimes I'll serve these sandwiches on whole wheat buns. Heat 2 Tbsp. 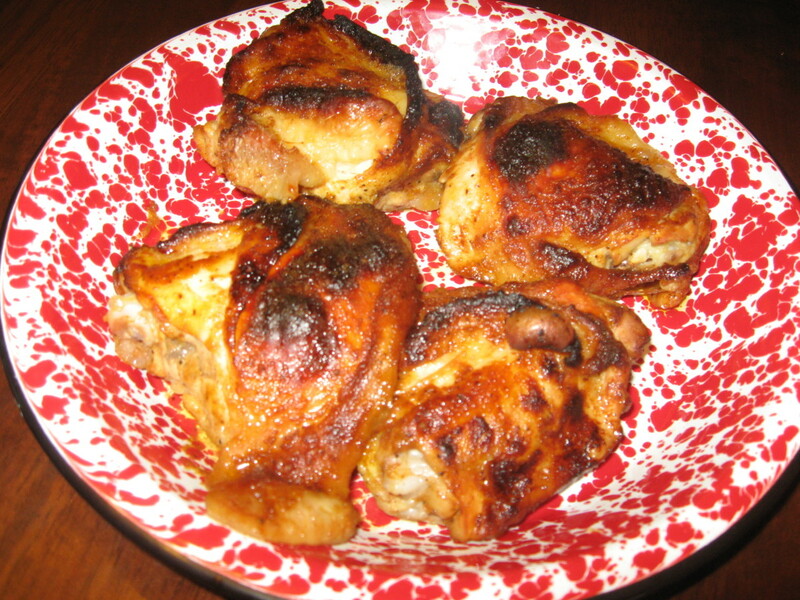 of the oil in a very large skillet or Dutch oven over medium-high heat. Crumble in the ground beef and ground turkey and cook, stirring occasionally, until the meat loses its pink color. Stir in the remaining tablespoon of olive oil and the onion and garlic. Continue to cook, stirring occasionally, until the onion is translucent. While the meat, onion and garlic are cooking, chop the peaches. Stir in the fire-roasted tomatoes, chopped peaches, peach nectar, molasses, ketchup, peach preserves, cider vinegar, Dijon mustard, chili powder, smoked paprika, liquid smoke and pepper. Bring to a boil, then reduce heat to medium and cook, stirring for another 20-30 minutes or until the sauce has thickened. 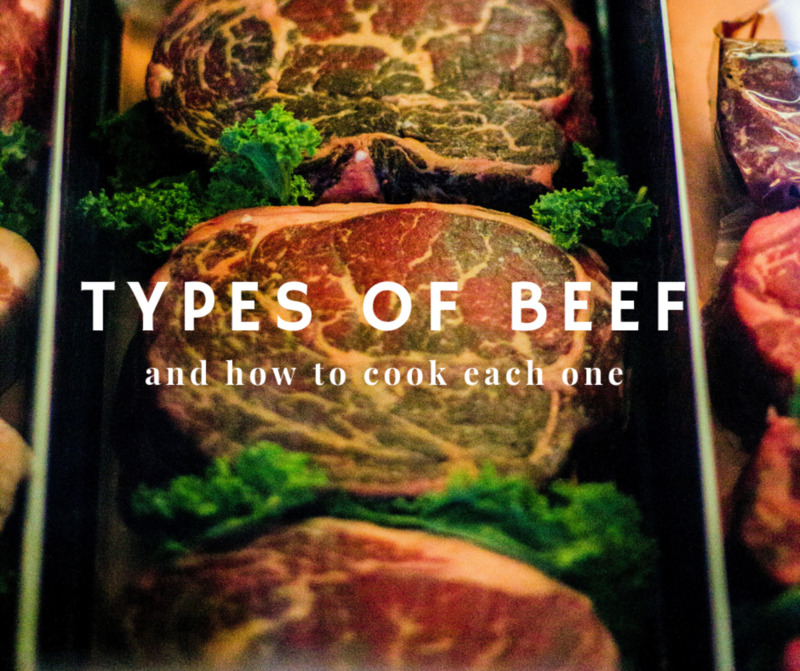 Taste and adjust the seasonings, if necessary. There is salt in the ketchup and diced fire-roasted tomatoes, but you may want to add a bit more, depending on your saltiness preference. Spoon the mixture over the bottom halves of the sandwich rolls or hamburger buns and add the top halves. Alternatively, serve as open face sandwiches and skip the tops of the buns. Note: This recipe may be made in advance and refrigerated or frozen and then reheated. It tastes even better after a day or two! What Do YOU Think of This Recipe? Please Rate It! 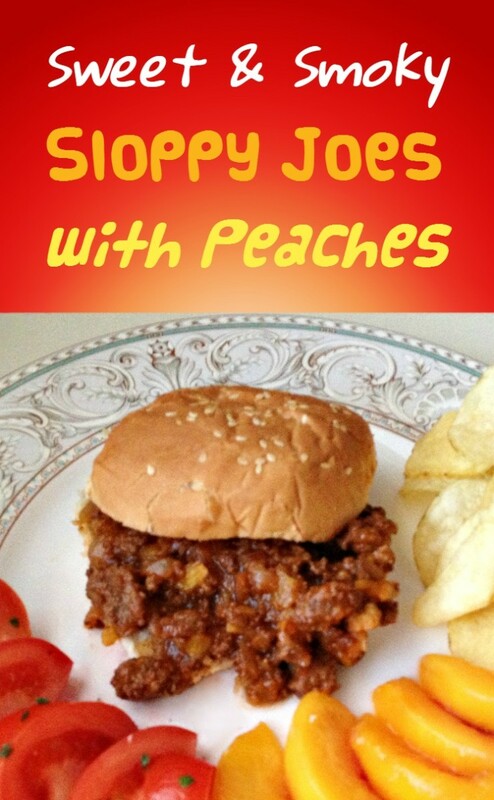 Are You Planning to Make My Sweet & Smoky Sloppy Joes with Peaches Recipe? Have I tempted you to try these? Probably. I'm bookmarking or pinning the recipe for future reference. Maybe. I'm on the fence. Probably not. Just not my cup of tea. Wait—You Call Those Southern Barbecue Flavors? Actually, Southern barbecue covers a wide variety of flavors, depending on the state. True, this recipe isn't based on traditional, thin, vinegar-based North Carolina barbecue dipping sauce, and while it contains mustard it's certainly nothing like the mustard and vinegar sauce served in South Carolina. But it's definitely related to the tomato and vinegar-based sweet-and-sour barbecue sauces served in Memphis, Tennessee, just thicker and smokier like the Kansas City or K.C. style sauces (and also sweeter than those). So while I would never presume to call the sauce in this recipe traditional Southern barbecue, it does have key ingredients from several different Southern (and Midwestern) style BBQ sauces. And of course there are those luscious Georgia peaches! Given that Alabama's mayonnaise, vinegar, lemon juice and black pepper "white sauce" is considered a legitimate element of regional Southern BBQ, I am quite comfortable calling this my own signature "Southern style" Sloppy Joes recipe. There are several meat substitutes that would work nicely in this recipe. Obvious choices include tempeh or meatless crumbles, but you could also use cooked and shredded canned young jackfruit (do not use mature jackfruit). 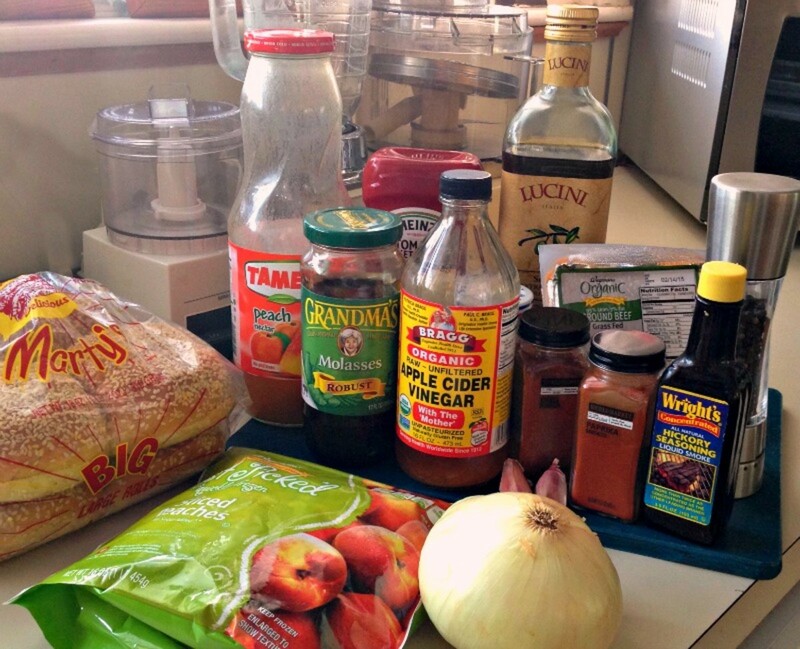 The following recipe video demonstrates one of several ways to cook and shred jackfruit for Sloppy Joes. Thank you, Cynthia! These taste NOTHING like canned Sloppy Joes. The peaches give them a special sweet-and-savory appeal that I think you'd love! I haven't eaten a Sloppy Joe in decades and then it was out of a can. Your recipe sounds delicious and I love the idea of adding peaches. Very unique and awesome! My eyes are bigger than my belly. Looks so good. I loved that you had your husband seal of approval. Have a great night. I've never tasted a Sloppy Joe, Margaret, but I'm intrigued by your Sloppy Giuseppe sandwiches and Greek Joes. Rhonda, thank you so much for your visit and your nice words about my recipe. I'm sorry that some of the ingredients aren't available in NZ, but it's a pretty forgiving recipe and I'm sure you could make a very tasty version substituting local ingredients, such as ground lamb for ground beef or turkey, and regular apricot jam for Splenda-sweetened jam. I hope you come up with a delicious variation! Looks good, but many of those ingredients are not available in New Zealand. Too bad, I miss sloppy joe. Forgot all about it. Oh this sounds tasty. I love the twist on the traditional sloppy joe! If I can get all the ingredients here, I will mos definitely try it, Margaret. My husband do appreciate a good burger. Thank you, moslimadelange! I'm glad you like the recipe. I hope you have the opportunity to make it some day. Being from this part of the world, I have never had a Sloppy Joe. It looks delectable! ! Hi, Kathryn (ecogranny)! We also have reduced our red meat consumption. When we do eat meat now, it's grass-fed, organic and very lean in this recipe I've added a little olive oil to compensate for the leanness of the beef, and the added peaches mean that there's somewhat less meat per serving (or a larger serving, for those who prefer it) than in traditional Sloppy Joes. You also could try substituting a vegetable-based protein such as tempeh for the ground beef so that you can satisfy your hankering. Thanks so much for your visit and your lovely feedback! Now that we eat very little meat, I sometimes get a hankering for Sloppy Joes. These look so much better than the recipe I used for years and years. I can almost taste the flavors, and the texture the peaches would give. Thanks for sharing your recipe. I haven't had one in a very long time... you have made me crave for some. Years ago, Margaret, I found a recipe for baked beans with peaches and, while the combination sounded odd, it was delicious. I'm sure your sloppy joe recipe will be even better. It sounds awesome and looks delicious! Looking forward to trying it. Wish I had a batch of it in the refrigerator to heat up right now! Your dinner looks perfect for summer and as I am a muncher at heart this is definitely the kind of plate I enjoy. Snacks to satisfy my munchy nature and the burger to supply the filling : ) Perfect. 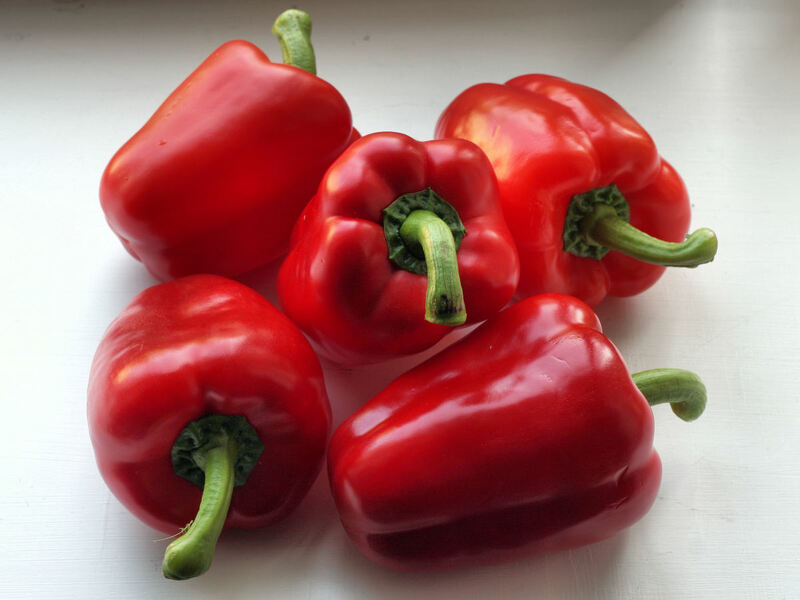 I've got stuffed peppers in the oven right now but wish I didn't! I'd make this sloppy joe recipe in a heartbeat! Looks delicious. Debra (Lady Guinevere), thanks for the lovely comment! I hope you do get a chance to make them. If so, please let me know how you like them. Thanks! This sounds delicious and I might make them when we get paid next. Not sure about the peaches. But I would give it a try. Thanks so much for your lovely comment, Nancy! I'm not a big fan or traditional sloppy joes, either, which is why I keep making variations with more interesting flavors. That way both my husband and I can enjoy them. :) I really appreciate your visit and your comment and I hope you get a chance to try these. I think you'll really enjoy them! Hi peachpurple, I've never heard of a "sloppy burger", so I'm not sure whether these Sloppy Joes are the same thing. Thanks and I'm glad you like my recipe! Margaret, I've never cared for Sloppy Joes, but I believe I could fall in love with these really fast. Thanks for an innovative recipe that sounds delicious, will try it.